A recent survey revealed that kids are banking at earlier ages than their parents. 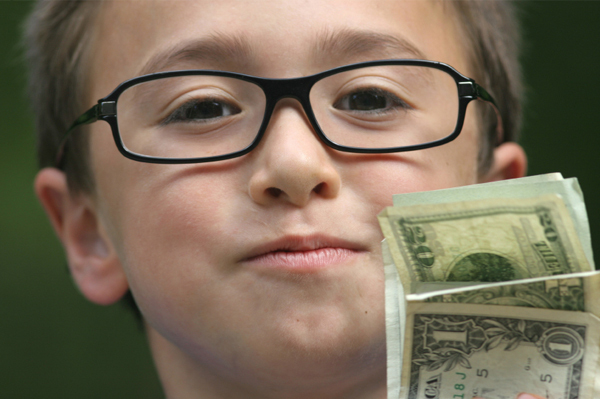 Here’s how to teach your kids important money lessons. Audra Kell and her husband opened up savings accounts at a local bank when her boys turned 6. “We had many relatives who gave money as gifts for Christmas and birthdays. We told our boys that we would match, dollar for dollar, any amount that they chose to save,” says Krell. Teaching their kids to save money was important to them. The boys had rules, however: Any amount deposited couldn’t be withdrawn for nine months. For large purchases, a request had to be made in advance and approved — and even then, it couldn’t be made for nine months. “Most times over the years, the boys would forget about the big item they were saving for, or decide it wasn’t that important to them,” says Krell. The efforts to teach their sons money management paid off. Their oldest used a portion of his sizeable savings account to help buy a car. “He is glad he didn’t spend his money over the years. It was great to have a lot of money saved for what he believes is his most important purchase,” says Krell. Parents like the Krells are trying to teach their kids to be financially responsible so that they can grow into productive, money-conscious adults. A new survey by Money Management International (MMI) showed that more parents are teaching kids to save money. The “2010 Kids and Money Survey” looked at how kids today learn about money compared to how their parents learned, and revealed that more kids are banking at younger ages now. According to the survey, three times as many kids under age 10 have bank accounts as their parents did at that age. Furthermore, piggy banks aren’t just cute; parents are using them as learning tools to teach kids money lessons. In fact, twice as many parents are doing that today as when they were children. So, what are kids spending on? According to the survey, 49 percent spend on wants like games and snacks, while 27 percent save their money, and almost 20 percent spend on needs such as clothing and school gear. Today, parents have a variety of tools online that can help them teach kids to save money. For instance, MMI’s Money Bunny program is aimed at kids ages 4 to 7, as a fun tool for teaching them about finances in language they can understand. Communicate with your kids about money. Even toddlers need to start learning about the basics of budgeting, goal setting, savings, sharing and spending, and needs vs wants. As kids grow older, create household goals and keep the finances transparent. You have financial limits, and the kids should know about those limits. We all want to give our kids every opportunity; however, there are limits as to what we can and cannot afford. The kids should be aware of those limits, even when they become adult children. Give the kids a budget early on. Put in a line item in your household budget for expenditures they can control, such as clothing, back-to-school supplies, entertainment (movies, birthday party gifts, games). They will have to decide how that line item will be spent every month or carried over into the next month for something bigger. Keep learning about better ways to manage your finances. This goes for both parents and kids. Keep up to date together by reading consumer articles, conducting research/cost comparisons on larger purchases, and continuing to seek out new tools to improve your finances and theirs.